We have been excited for this moment to be upon you, this moment of the solstice wave of energy. And now, it is here, and it is having the desired effect on humanity. You are receiving these high frequency energies, and we can see the vast majority of those of you who are awakened accepting these energies into your fields and physical bodies. For some, it will take a little longer to open up, but they eventually will. For those who are asleep, these energies will wait in their energy fields for the appropriate timing. Those of you who are ready for more transformation have been expecting to receive, and now that you have the energies upon you, there are some ramifications that you must deal with. For example, some of you will sleep more and some of you will sleep less. Some of you will eat more, and some of you will eat less. Some of you will feel euphoric, and others pain. There is not one right response. You are not all in the same place, and you have not all had the same previous life experiences, in this lifetime and in all of the others. So the energies will affect you differently, and every one of you will receive exactly what you need. This wave of energy was designed to serve and to bring about more of the transformations that you’ve been asking for. It’s also going to drum up some past life connections, especially to Atlantis, and you are going to feel the effects of it for quite some time. There is much within this wave to assimilate. So you will want to hydrate, rest, and ground yourselves. You will want to let yourselves feel everything that comes up for you, as always. 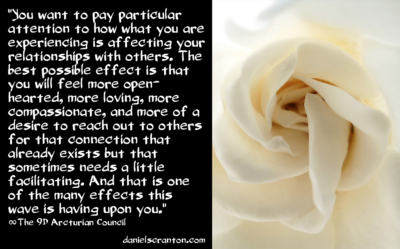 But you want to pay particular attention to how what you are experiencing is affecting your relationships with others. The best possible effect is that you will feel more open-hearted, more loving, more compassionate, and more of a desire to reach out to others for that connection that already exists but that sometimes needs a little facilitating. And that is one of the many effects this wave is having upon you.